Easily connect your team through one system no matter where they are or what device they are using. Quickly scale up to exactly meet your business needs whenever you need. Reduce your administrative overheads with a single web interface for provisioning, reporting and monitoring. A single cloud service which delivers modern contact centre features for your clients and unified communications & collaboration tools for your staff. You can call us in business hours and speak to a UK-based engineer who will resolve your problem, on average, within 17 minutes. You will only wait an average of 27 seconds in the call queue. Your service will be hosted on secure UK based servers, giving you full control of performance and removing the risk of data leaks through tight security. Hostcomm applies its PCI DSS compliance procedures and policies to all of our services ensuring your data is always secure and the business continuity is assured. Calls can be encrypted using TLS and SRTP. We can provide you with cloud communications, internet connectivity, phones, security devices and inbound / outbound contact centre features. 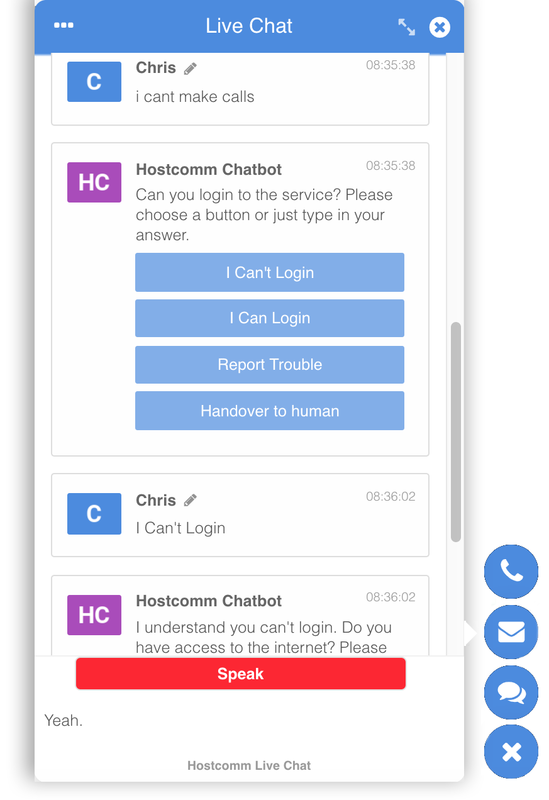 You can integrate Hostcomm's chatbot service with your cloud UC service so that your live agents and chatbots can work as a team. Don't take our word for it sign up for a free 30 day trial today! Real time web communications without the software installation hassle. Instant messaging can be set up in minutes so your team can chat, collaborate, share media, share screens. Multi-party video conferencing is a easy as setting up a voice call. Why waste time in meetings when everyone can keep up to date in real time, teamwork and collaboration has never been easier. If you would prefer a normal SIP handset, we support Cisco, Grandstream, Yealink, Polycom, Snom and lots of others. Set up Queues, IVRs, call recordings, conference rooms in minutes. Integrate a customer service chatbot with your contact centre for 24x7 customer service. Call recordings are stored in encrypted locations on Amazon S3. Advanced call recording web interface search facility. Call recordings are stored on Amazon S3 where they are encrypted at rest. Always on, on-demand or API-based call recording. 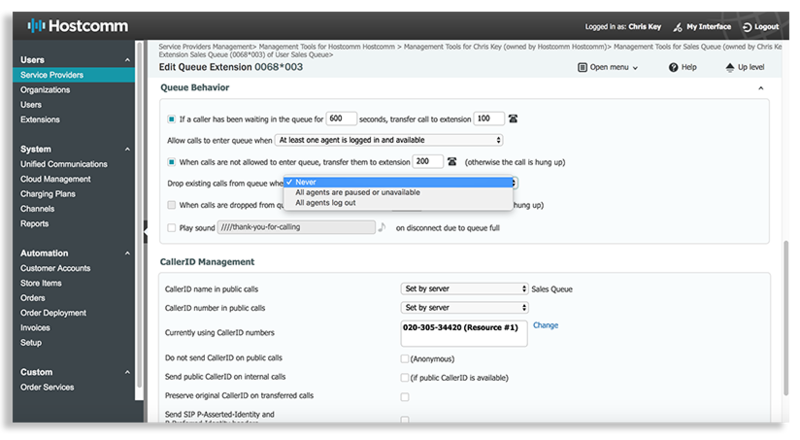 Call recordings are stored in encrypted locations on Amazon S3 and in a PCI DSS network. 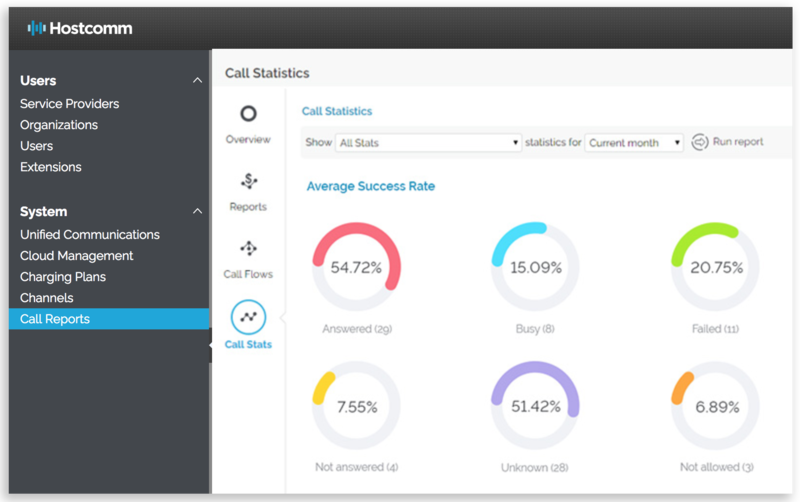 See live calls in real time from the contact centre or normal office workers. Analyse historical staff productivity data to spot good and bad trends. Call analytics and redaction is also available for the removal of unwanted sensitive data. The same great service however your clients choose to communicate with you. There's no need to change SIP handsets or soft phones, they can be re-used. Grandstream, Cisco, Polycom, Yealink, Counterpath, Zoiper all supported. Calls can use TLS if the device supports it ensuring the call cannot be listened to or intercepted. 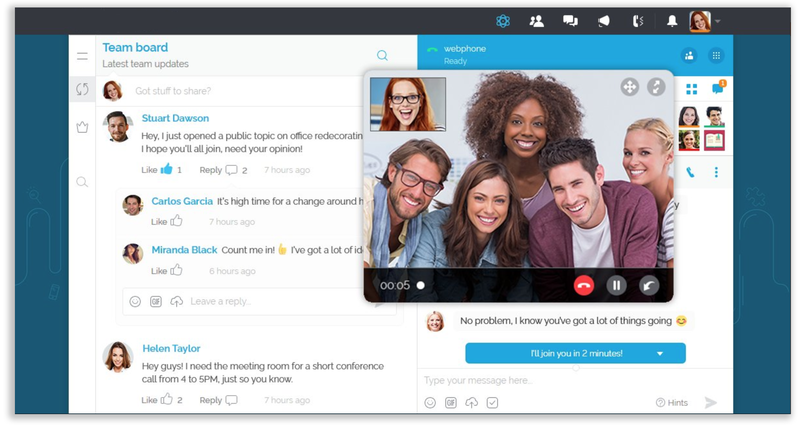 Web application has a WebRTC client which can be used instead of a SIP phone. Queues, IVRs, conference rooms, Fax, HD Voice & Video. Advanced hosting telephony from Hostcomm is a competitively priced service, giving you all the business communications you need. To see your extension plan, simply add the options required, and whether you want to opt for all inclusive or service only. With Hostcomm, adding extra seats for more agents is simple and easy.